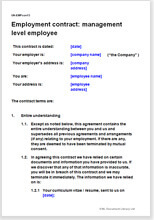 A comprehensive employment contract for managers or other senior level staff who are not company directors. It can be used in organisations of any type, any business and any size. This employment contract covers all legal requirements for information to be given to a management level or senior employee. It is a carefully considered framework for fair and full protection of the employer and compliance with organisational requirements. Use of plain English makes editing easy and allows it to be understood by all parties. It can be used by any employer, regardless of the type of organisation, the business of the organisation or the duties of the employee. The differences between this contract and the standard Net Lawman employment contract are relatively small. In this "information age", we feel that all employment contracts, regardless of the position of the employee, should be very strong on protection of the employer's confidential information and the prevention of the employee from starting a competing business. Removal of a trial period (sometimes called a probation period): in law, having a trial period does not change the rights of either the employee or the employer during or after the trial - the benefits of inclusion are motivation during the first months and fostering of goodwill if the employment doesn't work as expected. If you require any of the above in your employment contract, please contact us and we would be happy to include them for you. Other employment policies and procedures not within the written statement (such as data protection) could be included in the employment contract. However, especially when you have many employees, changing each employee’s contract of employment (and ensuring consistency between employees) every time a new law changes can be time consuming and difficult. It is usual, therefore, to place all procedures and policies common to all staff in an employee handbook and refer to the handbook in the employment contract. This is the approach Net Lawman recommends.